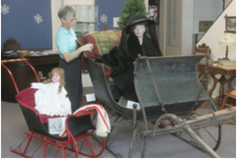 Suzy Frederick, curator of the Dekker Huis/Zeeland Historical Society Museum, discusses a sleigh, or cutter, on display in the new exhibit "Winter Memories" at the museum, 37 E. Main Ave.
Memories of winter's past are on display at the Dekker Huis/Zeeland Historical Society Museum. "Winter Memories" is the theme of the new exhibit at the museum, located at 37 E. Main Ave. The display includes indoor and outdoor winter scenes that date back before television and computers. The items showcased are pre-1900s, said Suzy Frederick, the museum's curator. One outdoor scene includes sleighs, or cutters, for an adult and child. Sleds, snowshoes, a fur-lined man's coat, and metal and wood ice skates also are a part of outdoor scenes. An indoor parlor scene depicts how families spent time together entertaining themselves. They listened to records on an Edison phonograph or viewed scenes in a stereoscope, Frederick said. Another scene features a one-room schoolhouse. Frederick said the exhibit has something for everyone, including a hands-on exhibit where children can experience the sounds of sleigh bells. Anna VanDeventer, the museum's manager, said the items on display are all local and have been donated to the museum. VanDeventer said the display will be up until spring. The museum's winter hours are 10 a.m. to 2 p.m. Saturdays. Admission to the museum is free with donations accepted. For more information, call 772-4079.